Three more automakers join EV race: The days of putting a small number of “compliance cars” in California to meet zero emission vehicle rules appear to be ending. Mazda, Subaru, and Toyota are preparing to enter the global competition. Regulatory pressure is increasing across the world, and competitors have been announcing lofty electric vehicle production schedules. Honda is another Japanese automaker that has hinted that it’s going along this path, too, with an electric version of the Clarity coming out and more EVs on the way. Mazda will launch an EV in 2019, and Subaru’s will follow in 2021. Toyota recently announced it will launch an “in-house venture company” next month to start developing battery-powered cars. Not long ago, Toyota broke its ties with Tesla for using the electric car company’s drivetrain in the electric RAV4. Toyota says it’s more committed to hydrogen fuel cell vehicles, but EVs can’t be put off any longer. Canadian clean fuels standard: The Canadian government adopted a national clean fuels standard last week for climate action and growth in its cleantech economy and green jobs. It follows previous actions in British Columbia, Oregon, and California, and is expected to greatly improve availability of low carbon fuel choices and competition at the pump. Fuel suppliers have several options for meeting the clean fuel standard. They can employ lower carbon fuels blended into, or replacing, gasoline and diesel, or improve the emissions associated with upstream oil and gas extraction and refining. The new standard will also promote fuel switching to electric mobility and hydrogen fuel cells. The standard will require fuel suppliers to progressively reduce the carbon pollution in their fuels, with annual reduction requirements within a specified overall timeframe. In-fighting at VW: A “cut-throat battle for resources” is happening in-house between Volkswagen and its Audi and Porsche premium brands as the automaker cuts costs to face the diesel emissions cheating scandal. Every VW brand with engine-manufacturing capacity now wants a leadership role when it comes to electric motors, battery packs, and battery-cell expertise, according to an unnamed source. Cost cutting will include reducing jobs dramatically as the company faces as much as 30 billion euros ($32 billion) to pay global government penalties and settle lawsuits for the diesel emissions cheating scandal. VW has set the aggressive goal of rolling out 30 new electric vehicle models by 2025. Production and labor will have to be used efficiently to reach corporate targets, with layoffs in the works. In other news, VW has agreed to extend a 20 billion-euro ($21.2 billion) bank credit line, which is part of the company’s efforts to maintain its financial strength while it counts the full cost of its diesel emissions scandal. RFS volume: The Environmental Protection Agency released the final Renewable Fuel Standards last week, which raised the levels from 18.11 billion gallons this year to 19.28 billion gallons in 2017. This is a 5% increase from the proposed 2017 levels — 18.8 billion gallons of renewable fuel — that the EPA announced in May. About 15 billion gallons of this will come from conventional corn-based ethanol. While the ethanol industry praised the increase, Big Oil immediately went into attack mode. EVs vs. fuel cells: Stanford University’s Global Climate and Energy Project has released a study finding that all-electric vehicles make for a more economical choice for reducing carbon dioxide emissions due to their lower cost and significantly higher energy efficiency than do fuel cell vehicles. Hydrogen offers few additional energy benefits besides only emitting water vapor from fuel-cell cars, the study said. “Studies such as these are needed to identify the lowest cost and most efficient pathways to deep decarbonization of the global energy system,” said Sally Benson, professor of energy resources engineering at Stanford and director of GCEP. Selling diesel cars: Daimler may continue selling diesel-powered cars in the U.S., even though a Der Spiegel article said otherwise. Daimler’s sales of diesel cars make up less than one percent of its Mercedes brand’s car sales in the U.S, the company said. Volkswagen did say last week that it will stop selling diesel vehicles in the U.S. and will focus its attention on sporty utility and electric vehicles. RNG newsletter: Energy Vision’s Fall newsletter highlights a few developments in renewable natural gas including: Santa Monica’s “Big Blue Bus” fleet, which operates more than 200 transit buses, was the first in the country to commit to the combination of a new “near-zero” emission natural gas engine fueled by low-carbon RNG…….. Close to 140 business, government and environmental leaders and Energy Vision supporters from across the country gathered on October 13th to celebrate the organization’s 10th anniversary. E-bikes: Electric bike maker Zero Motorcycles’ bike series has had a few positive revisions made this year. The company now has 14 configurations with prices ranging from $8,495 to $18,690. Every Zero motorcycle gets more torque and power this year. The most powerful of the bikes, the Zero SR, now gets an impressive 116 ft.-lbs. of torque. That bike can go 202 miles in city driving and 101 miles per charge speeding around at 70 mph. Will top-selling Chinese electric carmaker BYD plunge into the U.S. market? China-based plug-in electrified vehicle manufacturer BYD has become the third largest seller of PEVs in the world. The company is following Renault-Nissan and right behind Tesla Motors in cumulative annual global sales through September; at 161,000 sold versus Tesla’s 164,000, BYD could become No. 2. BYD has now surpassed Mitsubishi as the third largest global seller of PEVs. Mitsubishi has seen most of that sales volume come through its Outlander plug-in hybrid doing well in Europe. During the summer, Mitsubishi announced that the long-delayed launch of the SUV in the U.S. market will be delayed yet again, the fifth time that delay happened since its 2013 Japan-market launch. BYD is seeing a limited but growing presence in the U.S. through its electric buses and sanitation trucks. But what about selling electric cars in hotspots like California and other U.S. markets with a lot of interest in PEVs? There have been rumors and analytical speculation about BYD, with its 10% ownership stake from Warren Buffet and Berkshire Hathaway, bringing some of its top-selling electric car models to the U.S. The company dominating the fast-growing Chinese PEV market should be able to grab hold of solid footing in America, right? Even with climate-change doubter Donald Trump taking over the White House, other automakers are counting on U.S. electric car sales to grow quite a bit. So far, China is winning out. BYD’s top-selling model, the BYD e6 all-electric car, was flat in sales not long ago with 33 units sold in China in 2010. BYD sold 3,118 e6 units in China last month. The company held five of the top 12 spots for PEVs sold in China during October. Competition has been with other Chinese brands, with the Tesla Model S coming at No. 12 that month. Tesla and other automakers with partnerships in China, including General Motors, are rolling out Chinese market versions of cars like the Chevy Bolt to compete in that fast-growing market. Chinese government incentives for new energy vehicles (NEVs).have made that growing market more attractive than the U.S. for BYD. Government subsidies in China can be as high as 90,000 yuan ($13,000) and more consumers are buying in. Chinese automakers are taking the market even more seriously with a wide range of passenger cars, crossovers, and SUV selling to Chinese consumers. Local Chinese automakers make up most of the electric car market and are now seriously investing in research and development, developing better cars with more power and longer range, which is helping sales. This year’s Guangzhou Auto Show, held this month in China, saw the debut of over 30 new energy vehicles. Starting in 2013, plug-in hybrids such as the BYD Qin and Tang, were top sellers for the company. More recently, all-electric models have taken the lead, with the e6 and newcomer models e5 and Qin EV300 doing very well. Increasing battery capacity and range for all-electric models has helped sales increase. BYD has also done well selling to both consumers and fleets in the Chinese market, as both customer segments show more interest in plug-in models overall and more confidence in all-electric models and China’s charging infrastructure. Incentives have been stronger in China for BYD. Earlier this year, BYD America Vice President Michael Austin said that the $7,500 tax credit provided by the U.S. federal government is insufficient if there isn’t support from the federal and local governments in the form of more charging infrastructure. Austin said that about 80 BYD e6 electric cars have been imported to the US, with about 50 of those brought to New York for taxi and ride-hailing purposes. BYD America has been visible at events in the U.S. such as ACT Expo with its electric bus models, which lead the North American market in electric bus sales. Other commercial vehicles are coming up. BYD America operates a manufacturing assembly plant in Lancaster, Calif. This month, BYD America launched the industry’s first all-electric, long-range electric garbage truck. The refuse truck was a project jointly developed with Wayne Engineering, an Iowa-based refuse truck equipment maker. There has been concern that Trump, with his doubts about climate change and the EPA, and support for fossil fuels, could alter national environmental and fuel-efficiency policies. Is the electric garbage truck a dying cause? Probably not, according to industry insiders. 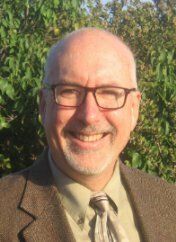 “No one has a crystal ball, but there are some business case and regional and global market trends that make us believe that electric truck development and targeted deployment will continue,” Bill Van Amburg, senior vice president and trucking programs director at Calstart, told Trucks.com. The trend toward greater electrification is meeting customer demands for efficiency and operational improvements and is not tied to U.S. energy policy, wherever that may end up going, he said. That perspective, for now, seems to be shared by automotive executives interviewed about the post-Trump election impact on U.S. auto sales. Ambitious goals of launching several new PEV models in the U.S., Europe, and other markets, still seem to be in place for Volkswagen, Daimler, BMW, GM, Tesla, and a few others. Last week, BYD completed registration of its office in Korea and secured a dealership to sell its cars. Tesla is also set to open a store soon, in the city of Hanam. Best fuel economy rating: The soon-to-be-released 2017 Hyundai Ioniq Electric took the No. 1 ranking for MPGe (miles per gallon equivalent) at 136 MPGe in combined fuel economy. The Ioniq Electric beat the all-electric BMW i3 with its 124 MPGe rating and 60 Amp-hour battery. The BMW i3 with a 94 Amp-hour battery came in fourth place at 119 combined MPGe. The BMW i3 REX (94 Amp-hour battery) and its range extender gasoline engine came in 7th place at MPGe combined. The upcoming Chevy Bolt took third place at 119 combined MPGe. It will have nearly double the range with the Bolt able to go 238 miles per charge versus 124 miles for the Ioniq Electric. These rankings come from the Fuel Economy Guide for model year 2017, which was just released by the U.S. Department of Energy (DOE) and the U.S. Environmental Protection Agency (EPA). Sustainable freight: The two largest North American ports, Los Angeles and Long Beach, have proposed the next version of the San Pedro Bay Ports Clean Air Action Plan (CAAP) that would aggressively deploy zero and near-zero emissions trucks and cargo-handling equipment. The ports also propose expanding programs that reduce ship emissions. Other proposals focus on freight infrastructure investment, innovation, and technology to improve supply chain efficiency and comprehensive energy planning. The updated CAAP provides one of California’s first opportunities to implement what was laid out in the state’s Sustainable Freight Action Plan. Mazda diesel and electric cars: Mazda Motor Corp. is moving beyond fuel efficient Skyactiv gasoline engine vehicles by adding diesel to the next-generation CX-5 crossover next year. Mazda also will introduce an electric vehicle in 2019 and a plug-in hybrid vehicle in 2021 or later, to meet increasingly stringent fuel economy rules. A revamped 2.2-liter Skyactiv-D clean diesel engine, modified to meet more stringent U.S. regulations for nitrogen oxide emissions, will be offered in the second-generation CX-5 during the second half of 2017, the company said. The next CX-5 debuted Tuesday at the L.A. Auto Show. Faraday factory: Electric supercar maker Faraday Future has stopped construction of its $1 billion electric vehicle factory in North Las Vegas, Nev. The Gardena, Calif., company, which has received backing and recent financial restructuring from tech billionaire Jia Yueting and Chinese company LeEco, said it plans to restart work on the plant in 2017. Last month, a construction firm working on Faraday Future’s factory warned the electric-car startup that it could face a work stoppage over millions of dollars in unpaid bills, raising questions about Faraday Future’s financial condition. 15 electric buses: California’s Central Valley took a major step to reduce emissions last week with a California Air Resources Board (CARB) funds award. The San Joaquin Valley Air Pollution Control District (SJVAPCD) will deploy 15 Proterra Catalyst electric buses, 11 Proterra depot-chargers, and four Proterra fast-chargers in order to improve local air quality and public health in disadvantaged communities throughout the San Joaquin Valley. Buses and charging deployment areas will reportedly include: the Fresno County Rural Transit Agency, the California State University Fresno, the City of Visalia Transit Division, the San Joaquin Regional Transit District, and the City of Modesto Transit Services. Sound factor: Hybrid and electric vehicles will now be required to make noise when traveling below 19 miles per hour. That ruling came from the National Highway Traffic Safety Administration after a long period of research and industry feedback. Known as the “quiet car” rule, regulators have taken a long time to decide on passing the regulation, as a ruling has been in the works since 2013. In the original proposal, the estimate was that it could reduce instances of injuries caused to pedestrians and bicycle riders by 2,800 per year, a figure that has since been reduced to 2,400 per year. NextEV: Chinese electric vehicle startup NextEV yesterday unveiled its record-breaking electric supercar, the first vehicle launched under the company’s new NIO brand. The new brand and the NIP EP9 electric supercar, which recently broke an electric vehicle lap record at Nürburgring Nordschliefe, were unveiled at a launch event in London. This is the first official launch since NextEV was founded in 2014. The company opened its Silicon Valley headquarters in October. Padmasree Warrior, former CTO at Cisco, is now serving as the U.S. CEO of NextEV. VW and Didi: Volkswagen announced last Thursday that it has been is in talks with China’s Didi Chuxing to set up a high-end ride-hailing service; the deal would also involve ambitious sales goals for electric and hybrid vehicles in the world’s largest auto market. That would help VW in its bid to beat General Motors as the largest-selling automaker in China. It would also be a channel for selling its ambitious plan for electric vehicle introductions in the wake of last year’s diesel emissions scandal. The automaker plans to sell 400,000 “new energy vehicles” in China by 2020 and 1.5 million by 2025. Didi is China’s largest ride-hailing company, with 300 million users across more than 400 cities. Launching new plug-in electrified vehicles (PEVs). Showcasing mobility technologies of the future at the all-new AutoMobility LA. Previously known for being the showcase for electric car launches and ride-and-drives, crossover SUVs are taking more of the attention this year. That doesn’t mean that new electrified vehicles and advanced mobility technologies were forgotten. Automaker displays this year at the Los Angeles Auto Show have been weighted toward crossover SUVs as market demand grows in an era of low gasoline prices and higher profit margins selling utility vehicles over PEVs. The all-new Ford EcoSport debuted ahead of the L.A. Auto Show on Monday, one of five crossovers and smaller SUVs that were premiered. Other small SUVs being shown are the Toyota C-HR, Jeep Compass, Mazda CX-5, and Alfa Romeo Stelvio. While Volkswagen has pledged to roll out 30 new PEV models by 2025, the gasoline-powered 2017 Atlas crossover has been its star at the L.A. Auto Show. On the plug-in electrified vehicle debut side, VW did announce changes to the e-Golf. The 2017 Volkswagen e-Golf comes with a new 35.8 kWh battery and 124 miles of range. 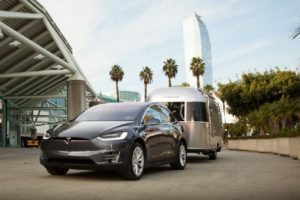 Tesla Motors: Tesla exhibited a Model X towing an Airstream trailer (see photo above). Inside the trailer, you could view a color display board for exterior and interior color combining options. A towing hitch was attached to the Model X in the display hall; the hitch can carry trailers that go up to 5,000 pounds. It was the first time Tesla has displayed an exhibit at the L.A. Auto Show in a few years. Hyundai Ionic Electric: Not a new debut, Hyundai has increased the electric vehicle’s range to 124 miles instead of 110 previously announced, and it goes on sale late this year. Hyundai also made three announcements about mobility services connected to the Ioniq during the L.A. Auto Show. 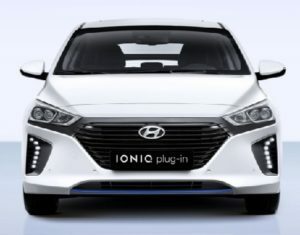 The new “Ioniq Unlimited” subscription-based ownership experience has one fixed payment that includes unlimited mileage, electric charging costs, scheduled maintenance, wear items and all typical purchase fees such as registration. A second program is being carried out with WaiveCar, an electric carsharing program running on advertising dollars. Consumers can drive an electric Ioniq wrapped in advertising with a rooftop mounted digital display for two hours at no charge. For the third announcement, Hyundai revealed an autonomous version of the all-electric Ioniq during the show. The company will offer rides in the self-driving version at the Consumer Electronics Show in January. It uses a Lidar system with three advanced radars combined with three forward-facing cameras, blind-spot sensors, GPS antenna and “smart cruise” radar to provide 360 degrees or protection and sensing. Jaguar I-Pace: Jaguar showed what will be the first step in its electrification plans. The all-electric I-Pace crossover SUV will have a 90-kWh battery for 220 miles of range. Jaguar says that it will be a high performance crossover with all-wheel drive propelled by dual electric motors, one on each axle. Its combined output of 400 horsepower and 516 pound-feet of torque. It’s expected to be released in 2018. McLaren Hyper-GT: McLaren’s hybrid super concept car is said to follow the iconic McLaren F1, which has been a star at Le Mans for nearly 25 years. It will be the “spiritual successor to the F1,” according to the company. The prototype Hyper-GT is coming out next year and a production version is set for 2019. Chrysler Pacifica Hybrid: While “plug-in” was dropped from the Pacifica’s name for the non-internal combustion gasoline engine version, it is a plug-in hybrid electric vehicle. It’s Chrysler’s first plug-in model to enter the U.S. market beyond test models. It is also an historic moment for Chrysler and parent company FCA Automotive. The gasoline-engine Pacifica is replacing the Chrysler Town & County and Dodge Grand Caravan as its minivan offering. The Caravan and its other variations had essentially created the minivan segment in the 1980s, and the Pacifica Hybrid will make for the first electric passenger van to be sold mass market. The 2017 Chrysler Pacifica starts at $41,995, not including destination. With the available $7,500 federal tax credit, customers can get the Pacifica Hybrid is for as low as $34,495, not including any state or local incentives. It was certainly a pleasure to drive and learn more about during the L.A. Auto Show’s ride and drive. Cadillac CT6 PHEV: While earlier this year, Cadillac announced that its low-selling ELR plug-in hybrid would be discontinued, there will be a replacement coming out soon. Starting early next year, the CT6 sedan will have a $76,090 price tag before the $7,500 federal tax credit and potential state incentives lower the price. It comes with powertrain technology similar to that used in the Chevy Volt, and will be getting 30 miles of electric range. Mini Cooper Countryman S E ALL4: BMW’s Mini brand has launched its first plug-in hybrid. The Countryman is larger than the original Mini Cooper with about 30 percent more cargo space. It comes with a 1.5-liter turbo thee-cylinder engine merged with electric propulsion, a 7.6-kWh battery, and a six-speed auto transmission. Mitsubishi eX Concept: Mitsubishi’s Outlander plug-in hybrid SUV has been a top electric seller in Europe and will finally be rolling out in the U.S. next year. The all-electric eX Concept is said by Mitsubishi as a hint to the future. As a new part of the Renault-Nissan Alliance, there’s been speculation over whether Nissan and Mitsubishi will share electric vehicle technologies. Chevrolet Bolt: The all-electric Chevy Bolt took Green Car Journal’s 2017 Green Car Of The Year award on Thursday morning. Other finalists included the BMW 330e iPerformance, Chrysler Pacifica, Kia Optima, and Toyota Prius Prime. Green Car Journal editors selected the 2017 Bolt for its “impressive 238 mile zero-emission driving range, stylish design, pleasing driving dynamics, and welcome suite of advanced and connected technologies.” It will start showing up next month in dealer lots. 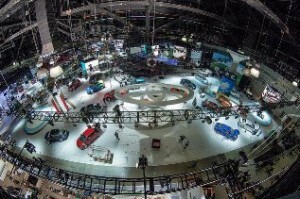 AutoMobility LA: AutoMobility LA merged the previous Connected Car Expo and the L.A. Auto Show into a special three-day event just prior to opening up the L.A. Auto Show to the general public. Technology Pavilion was held right outside the convention center, with vehicle and booth displays and a speaker hall. Olli: “Hello, I’m Olli. I’m self-driving. I’m adaptable. I’m efficient, and I’m around the corner. At Local Motors.” That was the first display you’d see when walking in the Technology Pavilion last week. 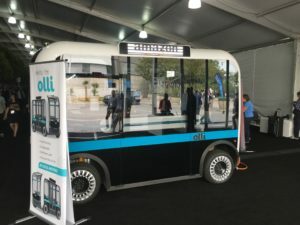 Local Motors specializes in co-creation design projects, such as the 3-D-printed, self-driving Olli minibus that’s currently being tested in pilot programs. It appears to be working on this electric, self-driving minibus project with Amazon, as you can see displayed in the exhibit photo. Designed to transport up to 12 riders, Olli uses IBM Watson’s “Internet of Things” cognitive computing capabilities to learn from data generated from sensors on the vehicle and encourage an interactive transit experience. Phoenix-based Local Motors is also working on a range of designs for 3-D-printed cars. The company recently sold some Olli units in Copenhagen and plans to announce its U.S. debut in next few months. It’s currently being tested on private roads in the Washington, D.C. area. On Wednesday of last week during AutoMobility LA, Olli shuttled Local Motors CEO Jay Rogers to his keynote address. ReachNow: BMW’s car sharing service announced four new mobility services and a Brooklyn location last week. During a press conference at AutoMobility LA on Nov. 15, ReachNow described four pilot programs to enhance its services: Ride, Reserve, Share, and Fleet Solutions for residential buildings. The car sharing service also described its expansion into Brooklyn, N.Y., its third North American city and the company’s first expansion beyond the west coast. The new services expand ReachNow’s offerings to include on-demand ride services similar to Uber and Lyft; an opportunity to schedule individual recurring rides; and exclusive use of BMW i3 electric vehicles and BMW 3 Series onsite at select apartment and condo complex locations. Vehicle offerings include the electric BMW i3, BMW 3 Series, Mini Cooper, and Mini Clubman. 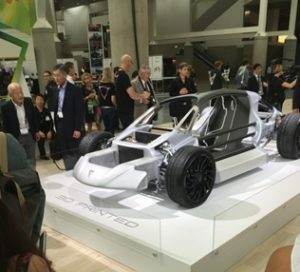 Divergent 3D: Headed by former Coda Automotive CEO, Kevin Czinger, the startup offers 3D printing technology and a combination of aluminum and carbon fiber. The company’s concept was designed to change the way cars are manufactured by using technology that reduces pollution and the amount of materials. Divergent 3D’s Blade printed supercar greeted visitors in the atrium of the LA Convention Center. The company also showed a 3D printed motorcycle, and a sports car frame displayed, as seen in this photo, during the L.A. Auto Show. Hyperloop One: CEO Rob Lloyd spoke during AutoMobility LA about Hyperloop One and meeting on-demand autonomous networks that will redefine cities and rewrite the rules of transportation for the future. The former Cisco executive became the startup’s CEO last year in September. The startup company, inspired by Tesla CEO Elon Musk’s 2013 concept design, is creating a tubular form of high speed transportation that can go 700 mph. On Friday, the company settled a lawsuit with Brogan BamBrogan, a co-founder and chief technology officer, and three other former executives, over alleged wrongdoing by management and investors. Electric launches at LA Auto Show: Along with crossover utility vehicles, plug-in electrified vehicles will see a few North American launches at the LA Auto Show. A refreshed e-Golf will be revealed with increased miles per charge (186 miles on European standards) and infotainment/connected car updates. The miles per charge range may be closer to 125 when defined by the U.S. Environmental Protection Agency using its own calculation – closer to the Nissan Leaf and Ford Focus Electric. For VW, it’s a jumpstart to a much larger post-Dieselgate electrification campaign with vehicles built on the MEB platform, including the all-electric ID in 2020. Jaguar will be showing the electric I-Pace crossover concept. The production version of the Tesla-competitor luxury electric car will be shown in late 2017 and go on sale in the U.S. in the second half of 2018. Also during the LA Auto Show (called AutoMobility LA during pre-show media and trade days), look for: all-electric models or concept cars from Porsche, Mitsubishi, and Mini; Cadillac will show off its CT6 plug-in hybrid; and Chevrolet will be promoting the all-electric Bolt, with its 238-mile range that starts shipping to dealers within weeks. 100K EVs sold per year: BMW Group wants to boost sales of battery electric and plug-in hybrid cars by two-thirds next year to 100,000 vehicles, the company said. The German automaker expects to increase deliveries of vehicles from its “i” subbrand to around 60,000 units this year. BMW expects electric car sales will grow three-fold. Sales of battery-powered BMW models have totaled about 100,000 cars since November 2013, according to BMW. BMW currently sells the compact i3 EV and i8 plug-in hybrid supercar in its electric subbrand. The automaker has said it also plans to add an electric Mini and BMW X3 SUV by the end of the decade. Audi gasoline engines: Automotive litigation firm Hagens Berman has filed the first class-action lawsuit against Audi over charges that the automaker illegally installed an emission-cheating device in 3.0-liter gasoline cars. Models names in the suit include the Audi A6, Audi A8, Audi Q5 and likely the Audi Q7, as well as potentially several other 3.0-liter, automatic gasoline models. In related news, on Thursday a coalition of Audi owners sued the company’s Audi AG and Audi of America, LLC units after reports surfaced over the past weekend that certain gasoline powered Audi vehicles were equipped with emission control defeat devices. Similar to last year’s revelations involving Volkswagen’s diesel models, it is alleged that the California Air Resources Board has discovered cheat software installed by Audi engineers in certain 3.0 liter A6 and Q7 Audi vehicles. Green Car of the Year award: Green Car Journal announced the five finalists last week for its annual award, four-out-five of which are available now in plug-in hybrid variations and one being an all-electric vehicle. The five 2017 model year nominees for the Green Car of the Year award are: the BMW 330e, Chevrolet Bolt, Chrysler Pacifica, Kia Optima, and the Toyota Prius Prime. The winner will be announced Thursday morning at the LA Auto Show. Green Car Journal also recently announced that the Ram ProMaster City work van won Green Car Journal’s 2017 Commercial Green Car of the Year, the second year in a row it’s taken that award. The gasoline-engine ProMaster City was recognized for environmental attributes along with traditional features customers seek, such as functionality, versatility, safety, value, and style. The announcement was made yesterday at the 48th annual San Antonio Auto & Truck Show in San Antonio, Texas. Europe battery factory: Tesla Motors plans to begin looking for locations in Europe next year for a second “Gigafactory” to make cars and the battery cells to power them, the company said. Possible locations for the factory include the Netherlands, France and Spain, according to local media speculation. Tesla hasn’t communicated a preference. The electric automaker already has a facility in the Netherlands that does final assembly work for European versions of Tesla cars built in the automaker’s Fremont, Calif, factory. Top 10 charging networks: Netherlands-based The New Motion charging network supplier has been ranked No. 1 in a Navigant Research report on charging networks, followed by the leading U.S., ChargePoint, at No. 2. EV-Box finished in third place, followed in order by Chargemaster, Fortum, Innogy SE, Greenlots, EVgo, Clever A/S, and Pod Point. Navigant based its rating system for plug-in electrified vehicle charger network suppliers on 10 criteria: vision; go-to-market strategy; partners; product strategy; geographic strategy; market presence; marketing and distribution; product performance and reliability; product and service capabilities; and staying power. Supercharger network: Tesla Motors announced that more than 4,600 Superchargers have been installed around the world that allow over 160,000 Tesla owners to drive across the continental U.S., from the Arctic Circle to the south of Spain, and across all of the population centers in China and Japan, among many other places. The Supercharger Network, which Tesla calls the world’s fastest charging solution, was designed by the automaker so that all customers have access to a seamless and convenient charging experience when they’re away from home, as our intention has always been for Supercharging to enable long distance travel. NHTSA noise rules: The National Highway Traffic Safety Administration has issued new standards to automakers requiring audible alerts required on all new hybrid and electric vehicles going forward beginning September 1, 2019. The new sound requirements applies across the U.S., and should help prevent as many as 2,400 pedestrian injuries each year once they span the range of EVs and hybrids on the road, according to the agency. The new rule says that all-electric, plug-in hybrid, and hybrid vehicles that have four wheels and weigh under 10,000 pounds must make an audible noise when traveling either backwards or forwards at speeds up of to 19 miles per hour. As the stunning election results settle in, speculation on the implications is pervasive through news and social media channels. I do have two questions. What will President-elect Donald Trump’s administration be doing, and opposing, in the realm of cleantech and transportation? What can clean transportation stakeholders do to respond? To start off, what happened with the election that set up such stunning results? Media analysts and pundits were using early polling findings and experience from past elections to assume they knew the outcome, until election evening. Pollsters assumed they knew how voters were going to vote, and they did seem to be accurate about how regular voters were going cast their ballots. It turns out that quite a few disenfranchised voters who hadn’t punched a ballot in years showed up and cast their vote for Trump. A lot of Millennial generation voters who had loved Bernie Sanders but settled for Hillary Clinton didn’t bother to show up and vote or to mail an absentee ballot. Clinton may have won the popular vote but lost in key electoral vote states, the fourth time that’s happened in U.S. history; but ballots are still being counted to determine the popular vote total. We may have received a signal of where the new administration will be standing on some of the relevant issues. Right after Election Day, a statement was released on a review of the fuel economy and emissions standards by the new administration. On Thursday, the Alliance of Automobile Manufacturers sent a letter to President-elect Trump’s White House transition team asking to ease regulatory pressure from the Obama administration’s fuel economy and emissions rules calling for 54.5 mpg by 2025. The rules, which become increasingly stringent in the 2017 model year, are considered to be a “substantial challenge” for the industry, according to the letter. While alliance members (including General Motors, Ford, BMW, Mercedes, VW, Mazda, Volvo, Fiat, and Toyota) have supported the program, the industry is concerned about the timing and costs of the rules, which will require billions of dollars in investment. Grant funding: U.S. Department of Energy and U.S. Environmental Protection Agency funding is likely to be scaled back as the Obama administration leaves office. That means low-interest loans and grants for advanced vehicle technology projects by automakers, suppliers, universities, and research center partners will probably lose funding. Other parties likely to lose funding include electric vehicle charging infrastructure suppliers; alternative fuel vehicles being deployed in the federal fleet; grants for research and development of alternative fuels like biofuels and renewable natural gas and diesel; and clean transportation projects aimed at cargo transport. Fleets, OEMs, and suppliers will need to tap into other resources like state, regional, and city funding programs; and university R&D projects. EV incentives: The Trump administration is likely to lose interest in renewing and expanding federal tax incentives for purchasing electric vehicles, which go up to $7,500. General Motors and Nissan are close to reaching the cap on allowable EVs qualifying for the tax incentives, and other automakers will follow. These incentives will go away unless renewed. Trump has expressed opposition to the government picking “winners and losers” and tends to not show support for government action continuing these types of programs. Like grants, automakers will need to turn to other sources like states for funding and utilizing their own purchase incentive programs to attract green car buyers. Globalization: Trump took on Ford Motor Co. and its plans to move all its small-car assembly plants to Mexico as a pivotal issue during stump speeches from the very beginning of his campaign. Ford is not the only automaker in Mexico, with Trump also taking aim at General Motors for its plans to invest $5 billion more in Mexico. Other companies have been there for years like BMW, Chrysler, Fiat, Honda, and Volkswagen. It certainly goes way beyond Mexico with automakers also investing heavily in operations overseas in places like China, India, and Brazil. Trump has been able to stir up anger and frustration for workers at vehicle manufacturing and parts and components plants who’ve lost their jobs in the Great Lakes region, or who’ve feared it will happen to them next. Union members who usually vote Democrat leaned toward Trump. Fear of losing jobs to overseas markets has touched a nerve. The United Auto Workers, which had campaigned against Donald Trump this fall, is prepared to support his bid to overturn the North American Free Trade Agreement. Trump has also said he plans to reject or renegotiate other trade deals. Automaker executives will have to sort this out in dealing with the Trump administration and its decisions on tariffs, trade agreements, and statements affecting the public’s attitudes about the auto industry. Tesla CEO Elon Musk’s viewpoint: “I think a bit strongly that (Trump) is probably not the right guy” for the presidency, and wouldn’t be the best candidate to represent the U.S. abroad, he told CNBC on the Friday before the election. Democratic presidential nominee Hillary Clinton’s economic and environmental policies “are the right ones,” Musk said. 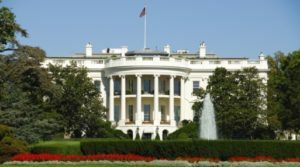 Other automakers have expressed concerns over policies likely to be adopted by the Trump administration, but have kept a neutral stance on the outcome of the election. CARB: California’s Air Resources Board has rescheduled a key hearing from Dec. 8-9 until sometime in February; that will be after Trump has taken office and there’s more clarity on where the nation’s clean-air rules overseeing vehicles are headed. The delay in the hearing is needed to give more time to gather reaction to recommendations the board staff is now preparing, a board spokesman said. The Alliance of Automobile Manufacturers also wants to see states follow CARB’s lead on the zero emission vehicle policy to avoid a patchwork of problems. Automakers would like to see the nine other states that have adopted the ZEV policy to follow California’s practice of supporting the mandate with tax incentives and other programs. That’s led to “dramatically” different ZEV credit purchase rates outside of California, the trade group said. Adoption of electrified vehicles: A report by Michigan-based analyst Alan Baum forecasts that by 2018, the number of hybrid, plug-in hybrid and all-electric models sold in the U.S. will jump to 92 from 58 this year. Baum expects hybrid and EV sales to rise well above their current margin of about 3% of U.S. new vehicle sales in the next 10 years. Daimler and BMW both have predicted plug-in electrified vehicle sales will account for as much as 25 percent of their total deliveries in about 10 years. Volkswagen said in June that the company will launch more than 30 all-electric vehicles over the next 10 years with a goal of selling two to three million of these EVs in 2025. Tesla will be producing about 500,000 electric vehicles beginning in 2018 as the Model 3 comes to market in late 2017. General Motors plans to compete directly with the Model 3 with its Chevrolet Bolt electric car, which just started rolling off assembly lines. Fleets will continue to play an important role: Fleets are among the early adopters for new vehicle technologies and will continue to play that important role. If Trump makes the climate change argument harder to buy into, fleets are usually skilled at making the case for adoption of clean vehicles other ways, including emphasizing energy independence and return on investment. The clean vehicle may be higher in acquisition cost but will reach payback in a reasonable amount of time compared to the cost of gasoline and diesel; and the cost of maintaining internal combustion engine vehicles when compared to plug-in electrified vehicles. Clean Cities coalitions have been very helpful in assisting fleets, and their OEM and supplier partners, to make the business case for adopting clean vehicles. Trade disputes: Arguments between the U.S. and China over fair trade practices will likely mean less in the coming years. GM, Ford, Volkswagen, Hyundai, BMW, Daimler, Nissan, Honda, Toyota, Mazda, and other automakers already have joint-venture alliances with Chinese automakers. EVs are being added to their product lineups for sale in China. Chinese automaker BYD has a large stake owned by Warren Buffet and Berkshire Hathaway. Tesla is investing heavily in setting up stores and service centers in China, and is eying Shanghai for setting up a factory. A similar trend is carrying over to the U.S. market, where Wanxiang America has set up its headquarters in Chicago, BYD is manufacturing and selling electric buses, and other Chinese investors have stakes in U.S.-based electric vehicle makers and suppliers. Whether Trump or auto workers like it or not, globalization is a dominant economic force, right up there with new technologies being developed. Automakers are looking at opportunities all over the world, including Renault-Nissan planning on bringing more hybrid vehicles to Europe to replace diesel cars; and Mitsubishi bringing its Outlander PHEV over the U.S. market after seeing it become a top-selling plug-in electrified model in several European countries. Creative financing: Federal grants and low-interest loans are likely to fade away, but there are other sources to consider. California is well known for grant programs, including through the AQMD entities; Chicago and New York have been funding clean transportation programs, and other cities and states are renewing their incentive programs. Startup OEMs, suppliers, and charging and alternative fueling infrastructure companies have turned to other capital sources and will continue to do so. Watch for more activity coming from crowdfunding, angel investors, and private equity firms. Ride-hailing giant Uber has set the tone for private investors to come through, and that’s crossing over to competitors and startups in food and packaged goods delivery. Hybrid and EV sales: Hybrid and plug-in sales followed the overall market, which has been down over the past three months. Hybrid sales in October were down 15.3% from September and 13.1% from October 2015. Plug-in hybrid and battery electric car sales were down 29.36% from September, but were up 13.47% over October 2015. 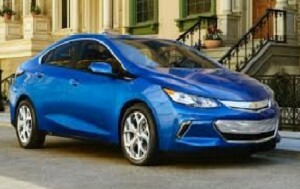 The Chevy Volt and Ford Fusion Energi led plug-in hybrid sales. Tesla saw a sizable drop in sales that may been affected by Tesla slowing down production to enable new autonomous technology hardware. Sales in November and December are expected to go back up as Tesla works hard at hitting quarterly sales goals. Building the Bolt: General Motors has started production of the all-electric Chevrolet Bolt at its assembly plant in Orion Township, near Detroit. The first of the electric cars capable of going 238 miles on a charge will show up for sales before the end of the year, the automaker said. Badged as the Opel Ampera-e in Europe, the new model is due to be launched in European markets next year. Toyota long-range EVs: Toyota Motor Corp. may be joining the race for long-range electric cars, according to the Nikkei. The automaker is exploring mass-producing battery electric cars that would hit the market by 2020, the Japanese news report said. In late October, Toyota said it has worked with Panasonic Corp., which also produces lithium ion batteries with Tesla, to improve the precision in battery cell assembly and extend range. This new battery technology will roll out soon in the soon-to-be-launched Prius Prime plug-in hybrid electric vehicle. That plug-in hybrid will go 37.3 miles on battery alone before the gasoline engine takes over; the new battery technology may go into all-electric, extended range cars, too. Uber and Maven: Uber announced it will be partnering with General Motors’ new carsharing service, Maven. Uber drivers will be able to rent GM vehicles on a weekly basis. GM and Uber will be in a 90-day pilot where drivers will be able to rent GM vehicles for $179 plus taxes and fees per week. That was a bit surprising given that Uber’s main competitor, Lyft, now has a partnership with GM. A similar program, called Express Drive, had been started up for Lyft drivers and operates in about 10 U.S. cities. Alliances between automakers and mobility services continue to expand this year, including Toyota and Uber; Toyota and Getaround; and Volkswagen and Gett. LA Auto Show: The Los Angeles Auto Show is launching a pre-car show segment for media and industry professionals called AutoMobility LA. Taking place Nov. 14-17, and to the general public Nov. 18-28 at the LA Convention Center, the latest technology devices will be displayed that embrace all forms of transportation and complement new and traditional vehicles. Located in the South Hall Atrium, “GO” features the latest smart mobility devices that can include electric scooters, bikes, or mobility apps. Also keep in mind that the annual Green Car of the Year award winner will be named on Thursday, Nov. 17 at the Technology Pavilion at LA Auto Show. Free Tesla charging ending for new owners: Tesla owners had been able to fast charge for free for the past four years, using Tesla’s Supercharger Network. Drivers had access to free charging at a worldwide network of 4,600 chargers. That will come to an end soon as the company adopts a “change to the economics of Supercharging.” Cars ordered vehicles before January 1 and delivered before April 1, 2017, still will have free access to Superchargers. Customers who order after Jan. 1 will receive 400 kilowatt-hours – about 1,000 miles – of free charging credits annually, then will pay a fee “less than the price of filling up a comparable gas car,” the company said. Upcoming Model 3 owners won’t have access to free charging, CEO Elon Musk said during a shareholders meeting in May. VW scandal continues: Volkswagen AG’s chairman Hans Dieter Pötsch has been added to the list of executives under investigation over fraudulent emissions reporting. The chair and former chief financial officer is suspected by German prosecutors of violating securities laws, especially failing to notify shareholders quickly enough about the financial risks of the scandal. German prosecutors have been at work on plea agreements with other executives; and former CEO Martin Winterkorn and board member Herbert Diess have been under investigation for failing to disclose information. Gas and diesel engines waning: Internal combustion engines (ICEs) may be heading toward the end of their shelf lives, according to a Lux Research study. Governments may one day make them illegal and ICEs may be priced out of the market, according to the study. Netherlands has considered banning ICEs by 2025, with a similar debate starting in Norway. India would like to see 100% of new car sales go to something other than ICEs by 2030. Germany’s legislature is also considering a total ban by 2030. The study says that ICEs may actually decline earlier than government mandates push for. EVs are getting cheaper by the year, thanks to improving batteries and mass production. ICEs are getting more expensive, due to tougher fuel efficiency regulations that require more complex and pricier engineering like 10-speed rather than five-speed transmissions, double- and triple-turbocharging, and other new and costly technologies. Wrightspeed extended range trash trucks: Wrightspeed rolled out what is says was the first commercial application of a range-extended electric refuse truck last week. Through its partner company, The Ratto Group, in Sonoma County, Calif., Wrigtspeed’s turbine-electric powertrain will be placed in at least 15 vehicles deployed into the trash hauling company’s fleet over the next year. With fuel economy up to about 7 mpg in combined electricity-liquid fuel operation, the powertrain can slash annual fuel consumption by 70 percent or more compared with the average diesel garbage truck, Wrightspeed said. Lutz on autonomous vehicles: Bob Lutz, former vice chair at General Motors and champion of the Chevy Volt, thinks that fully autonomous vehicles are 15 to 25 years away. Lutz expressed his views during the annual awards dinner of the Michigan Venture Capital Association. His vision for the future is different than Google’s and several automakers. Cars will be replaced by “modules” that will look like telephone booths laid down, and electronically linked in a seamless train on the freeway moving at 200 to 250 mph. They’ll be powered by inductive electrical rails in the freeway, Lutz said. 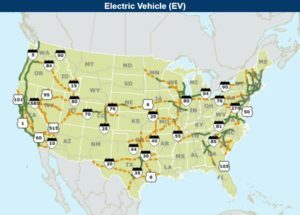 As you probably know by now, the Federal Highway Administration released a map last week showing 55 routes across the U.S. for charging plug-in vehicles and refueling alternative fuel vehicles, with 48 designated charging routes in the new corridor. The Alternative Fuel Corridors covers 35 states and nearly 85,000 miles, according the U.S. Department of Transportation’s FHWA. More miles will be added to the network to accommodate electric, hydrogen, propane autogas, and natural gas vehicles as more alternative fueling and charging stations are built. The designation of these corridors comes from the “Fixing America’s Surface Transportation” (FAST) Act, which was signed by the president in December 2015. In July, U.S. Transportation Secretary Anthony Foxx put the alternative fuel station provision in motion by calling on states to nominate national plug-in electrified vehicle charging and hydrogen, propane, and natural gas fueling corridors along major highways. You can view an Alternative Fuel Corridors resources page that includes a map showing each of the charging and fueling networks. There’s only one electric charging route linking the nation, which crosses the Great Plains with Highway 70 bridging between Utah and Colorado. Charging station routes are concentrated in the Northeast, East Coast, Great Lakes region, Texas, and the West Coast. Compressed natural gas will have corridors very similar to charging networks. Hydrogen fueling routes will be concentrated in California, Colorado, the Midwest, and the Northeast. During a telephone interview with CNBC on Friday, Tesla CEO Elon Musk didn’t support the corridor project. Tesla’s Supercharger fast-charging network has been in place with its own cross-country corridor for quite a while now, he said, and he didn’t see the point in talking about the federal program. Musk’s comments reflected Tesla’s competitive philosophy of having the best electric cars and charging in the industry, and the company doesn’t see the point of cooperating on, or supporting, industry and government standards. That response also speaks to challenges the fast charger network faces with the CHAdeMO, SAE combo charger, and Tesla standards differing. Looking at the Alternative Fuel Corridors maps, and the Energy Department’s data on alternative fuel stations, you can get a good look at where the clean transportation infrastructure stands in the U.S.
Propane has seen a dramatic drop in fueling stations during the past year – from 1,524 a year ago to 427 in the U.S. now, according to the Alternative Fuels Data Center. That’s likely been coming from propane networks consolidating stations to better serve the market. Some of the propane autogas stations are on private grounds not available to the public, such as school bus fleets. ICF International, Inc., based in Fairfax, Va., projects consumer propane sales to grow by about 9% between 2014 and 2025. Most of the growth will come from the propane engine fuel market, although lower propane prices associated with the growth in domestic propane supply and lower oil prices will also make propane more competitive in traditional propane markets, including residential and commercial space heating, and forklift markets, according to an ICF report prepared for the Department of Energy. Biodiesel has also seen a drop in the past year, at 236 last year and down to 170 stations recently. That may have to do with the EPA dragging out its ruling on the federal Renewable Fuel Standards and decreasing volume mandates on the advanced biofuel. Biodiesel is also seeing more competition come from renewable diesel, which is being adopted by several large fleets in California to tap into low carbon fuel standard credits. Electric charging stations, compressed natural gas, and hydrogen stations have seen impressive growth ratios in the past year. 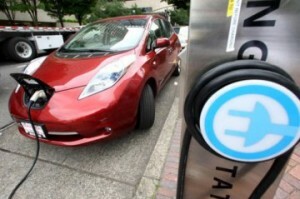 Charging stations grew by nearly a third in the past year, up to 14,683 stations. According to the U.S. Census Bureau, there were 114,533 gas stations in the U.S. at the end of 2012, the last year for which data is available, so there will need to be another 100,000 charging stations to match the reach of retail gas stations. The corridor routes will be seeing signs posted similar to what’s been typical on highways for years alerting drivers to upcoming gas stations, food, and lodging. It will play an important role in the federal government’s mission to reduce carbon. Supporting lower-emission vehicles will help the U.S. meet its 2015 pledge to reduce greenhouse gas emissions by 80 percent or more by 2050, according to the FHWA.